We had dinner in Calgary the other day at a fabulous restaurant serving Mexican food. Don’t jump into conclusions too fast. This is not the place to go for a quick taco and refried beans under a sombrero with a Mariachi band playing Besame Mucho in the corner. As it’s name suggests Xocolat Posh Mexican Cuisine serves traditional Mexican foods but with a modern high end flare. 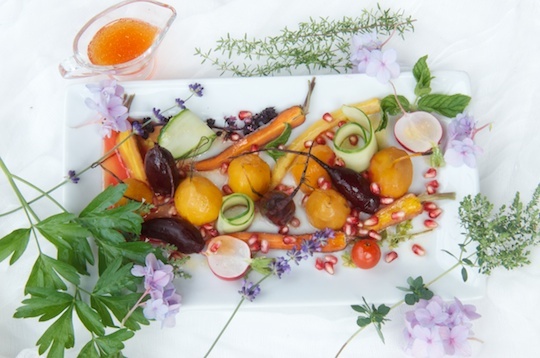 The result is gorgeous food, beautifully presented and perfectly flavoured. Can I be less ambiguous? I have eaten in authentic high end restaurants in Mexico City and other regions in Mexico and this restaurant ranks right there among the top few for me. Xocolat is owned by four entrepreneurs from Mexico and according to their website they believe that “Mexican gastronomy is an art to be appreciated and understood outside of Mexico”. I think that executive chef Eric Yavarino from Mexico City has hit the mark. Xocolat is a first class ambassador to high end Mexican foods outside of the Mexican borders. The space on 816-11th Ave. SW in Calgary is beautifully designed by Architect Sergio Antonio Ledesma in an upscale contemporary style. Hot pink themed artwork, linen and menus are set off against black tables and chairs (or is it dark xocolat? ), cream walls and a dark stone wall under a dark ceiling. The contemporary, uncluttered and stylish room is a perfect backdrop to the beautiful cuisine of Xocolat. Some of the items on the menu may sound familiar: Tacos, Tortilla Soup, Sopa de Frijol, Gorditas, Chilaquiles, Chile Relleno and Chile en Nogada but don’t expect an ordinary dish to appear at your table. 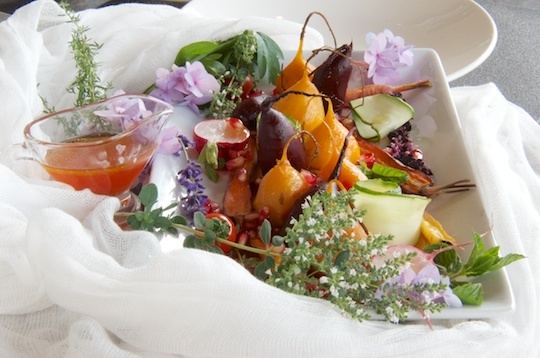 Everything reflects contemporary style, skillful preparation and is beautifully plated and presented. You can also get the traditional drinks, from red or white sangria, margaritas and Mexican beer to Mexican and South American wines. I personally evaluate restaurants by how they prepare their vegetables. In many restaurants vegetables are an afterthought and often disappointing. Not here. 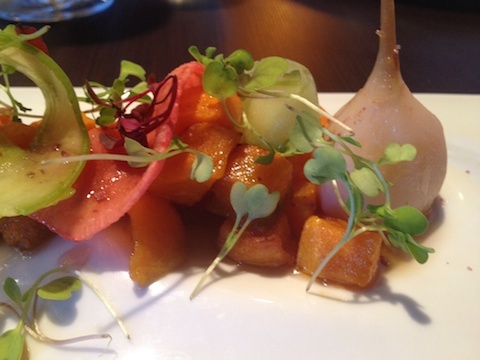 The squash, sweet potatoes, pickled and candied beets, and marinated cucumber formed part of the vegetable Autumn Plate I chose as first course. Just looking at the dish engaged all my senses. The colours, shapes, aromas and balance evoked a Monet composition. The vegetables were vibrant, cooked through yet with enough of a crunch and understated yet full flavour to satisfy you with every single bite. A true harmony of colours, textures and flavours that lingered on my palate like a familiar melody. I tried to “discreetly” snap a couple of pictures of the food with my iPhone (it’s annoying, I know) but it didn’t do the food justice. I didn’t take notes as I am not a food critic and we were there with company so some of the details evaporated to a dreamy memory but I do vividly remember how much I enjoyed the food. 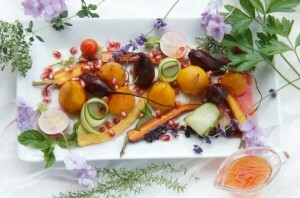 That vegetable dish is what inspired me to prepare the roasted vegetable autumn plate today. I roasted the beets, both yellow and red, whole and then peeled them while still warm, leaving the long tail end as intact as possible, similar to how they served theirs at Xocolat. 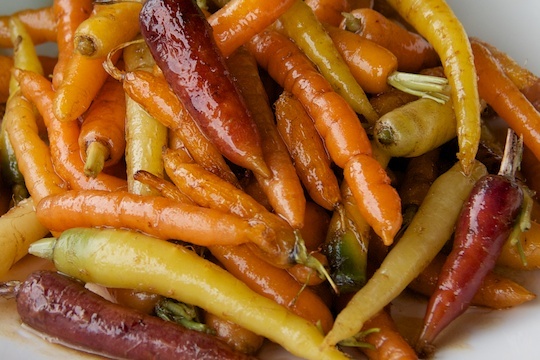 I also roasted a few small carrots, purple, orange and yellow, cut in half so they show their colours, and sautéed a couple of radishes in a little water and butter. I sliced the cucumbers into ribbons on a small mandolin type slicer and sprinkled the dish with a few pomegranate seeds. Garnishes are herbs and flowers from my roof top garden. I didn’t try to reproduce the Xocolat flavour elements and used a simple balsamic-honey mixture that I like to serve with beets. The honey balsamic glaze was drizzled over everything and voila, autumn plate to serve. It was gone in no time, and there were just the two of us for dinner here tonight. Wash and scrub beets but do not peel and do not trim the long root end, leave it intact. 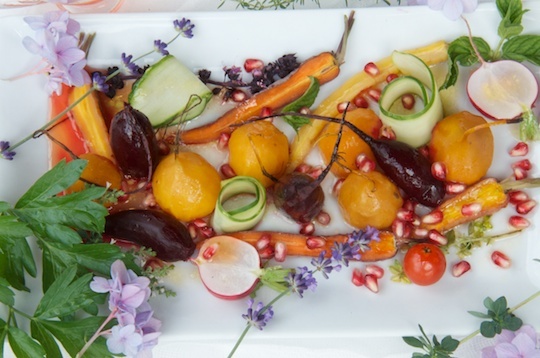 Prepare a packet for each of the yellow and red beets as you do not roast them together. Cut a large piece of foil, place the beets in the middle, then cut another piece of foil, cover the beets and pinch the ends together to create a sealed packet. Do a packet for the yellow and a packet for the red beets. I like to pour a 1/4 cup water into the packets before they go into the oven. It seals in the moisture and prevents the beets from burning. Place both packets on a foil lined baking tray (a lot of foil but less clean-up afterwards). Place the baking tray in a preheated 400℉ oven and cook for about 30 minutes or until they are cooked through and a can be easily pierced with a sharp knife. When they are done remove the tray from the oven and let cool until you can comfortably handle the beets. When they are cool enough to handle open one packet at a time and, wearing thin kitchen gloves to protect your hands from staining, gently peel the skin off the beets being careful to peel a little of the outer layer of the tail but not remove it completely. Once peeled leave to rest until ready to assemble the dish. If your beets are not small enough you can cut them in half now. The carrots are fresh and small so they will roast very quickly. Cut them in half, leaving about an inch of the green top end. Toss them with a little olive oil and place on a foil lined baking sheet. Roast in a 400℉ oven until they are done, which will happen very quickly. Don’t let them burn. Wash the radishes and trim the leaves, leaving about an inch of the greens still attached. Cut the radishes in half. 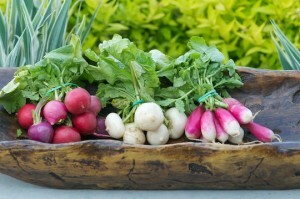 Melt 1 tablespoon of butter in a small skillet and add the radishes. Saute for a couple of minutes, adding a little water, about 1-2 tablespoons to prevent drying or burning. When ready, set aside until ready to assemble. Mix all the ingredients in a small jar and shake well. Use a rectangular plate if you have one. 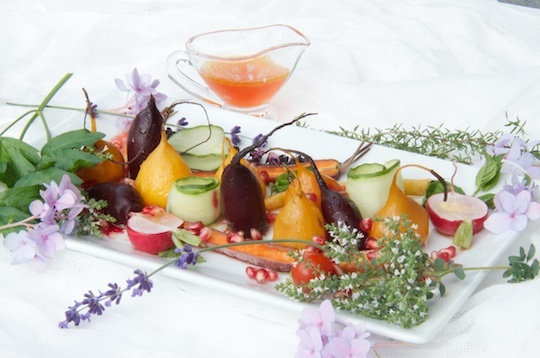 Place the beets on the plate, some can stand, others can lay on their side, place a few carrots around, add the radishes and cucumber ribbons. 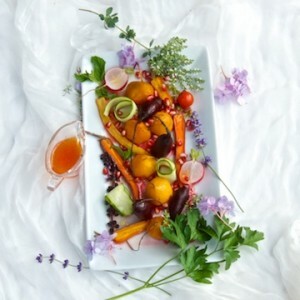 Drizzle the glaze over everything and garnish with herbs and edible flowers. Serve with salt and pepper and additional dressing on the side.